Of all the meal kits out there, Gobble may just be my favorite. The food is very good and it can be prepared in about 15 minutes. They accomplish this by using simple recipes and sending you some pre-cooked (lentis, rice). That convenience has a price, and Gobble has among the highest prices in the industry. Still, if I could afford it, I’d probably stick with Gobble because it gives you the satisfaction of mostly cooking a meal, without the necessary expenditure of time. Plus they have a good selection of international fare. Gobble offers plans for 2 or 4 people. 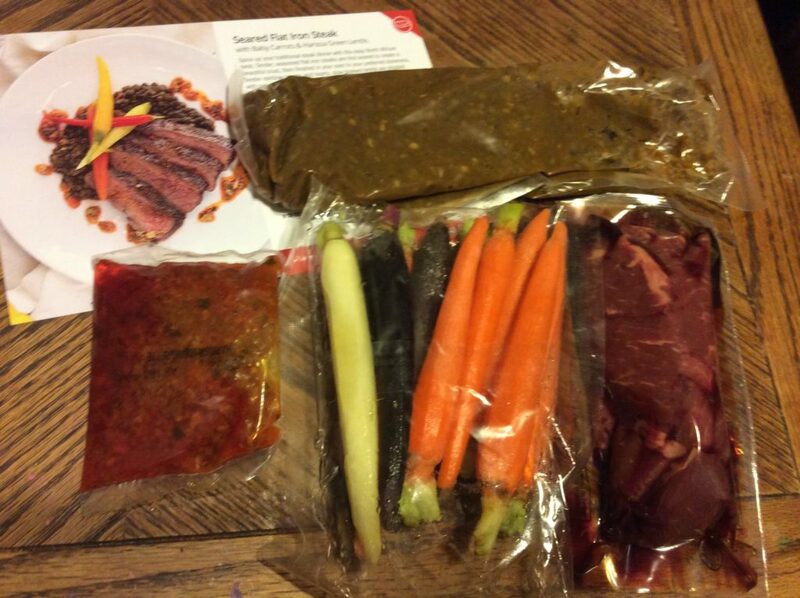 You can order as few as 2 meal kits a week or as many as you want. 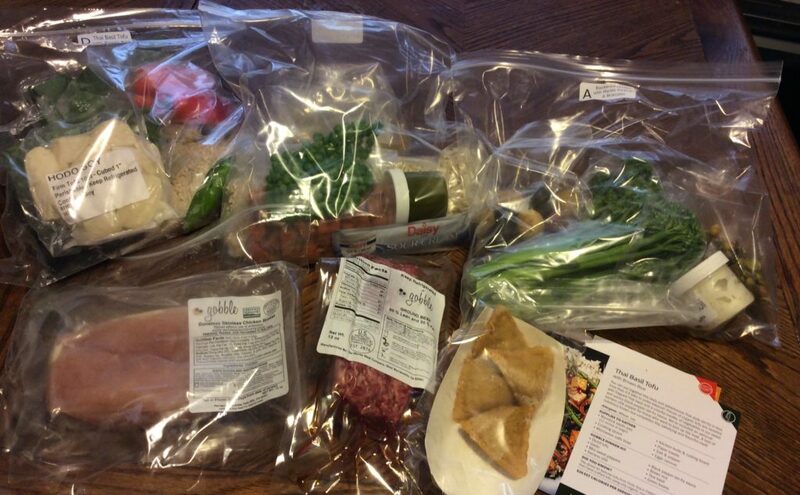 Cost is $12 a serving (or $14 if you only order 2 meal kits) – that is $24 per kit for 2 or $48 per kit for 4. You also have to pay $7 shipping, regardless of how many kits you order. Thus, the standard plan of 3 meals for 2 people per week costs $79. As other companies, Gobble usually offers discounts for its first week. Currently, you can get one free kit in your first box with this referral link. Gobble also offers lunch and breakfast subscriptions, but I haven’t tried them. Gobble offers mostly American and European food with some Asian, Indian and Mexican choices. They have numerous beef, chicken, seafood and vegetarian (but not necessarily vegan) choices every week. The dishes do take about 15 minutes to put together and most were quite tasty. 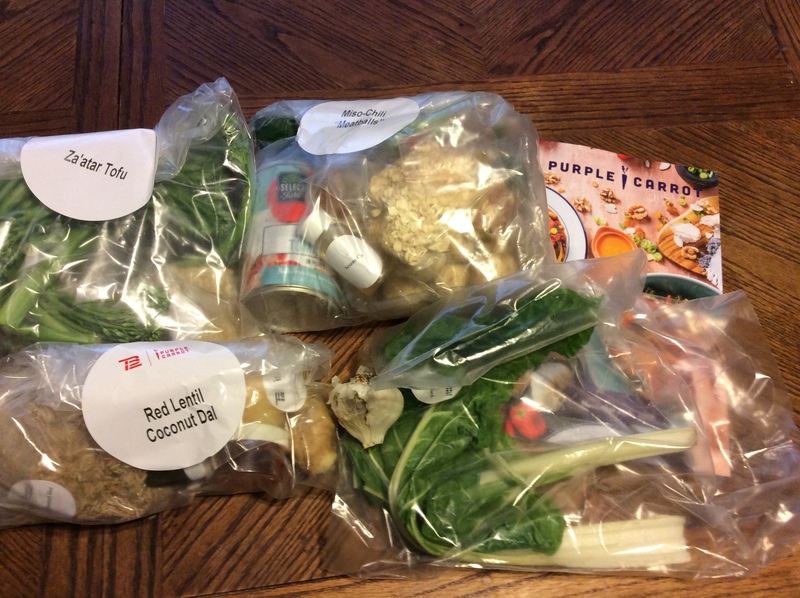 The dishes are simpler than those offered by other premium meal kit companies, but the ones I had were nice enough. 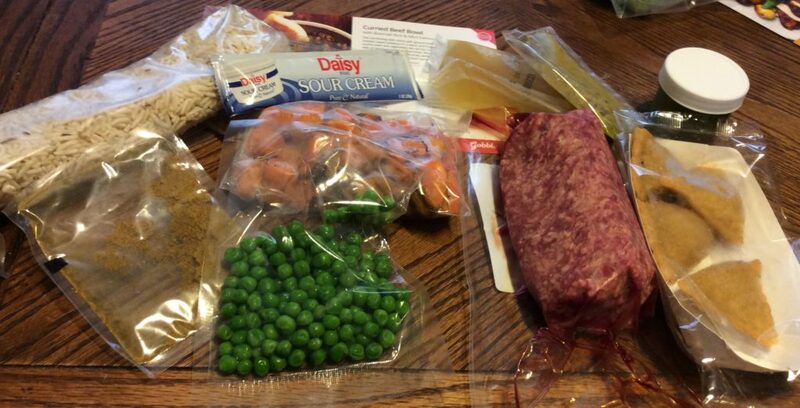 Cooking speed is also achieved by sending some ingredients pre-cooked, you just have to warm them in the microwave. 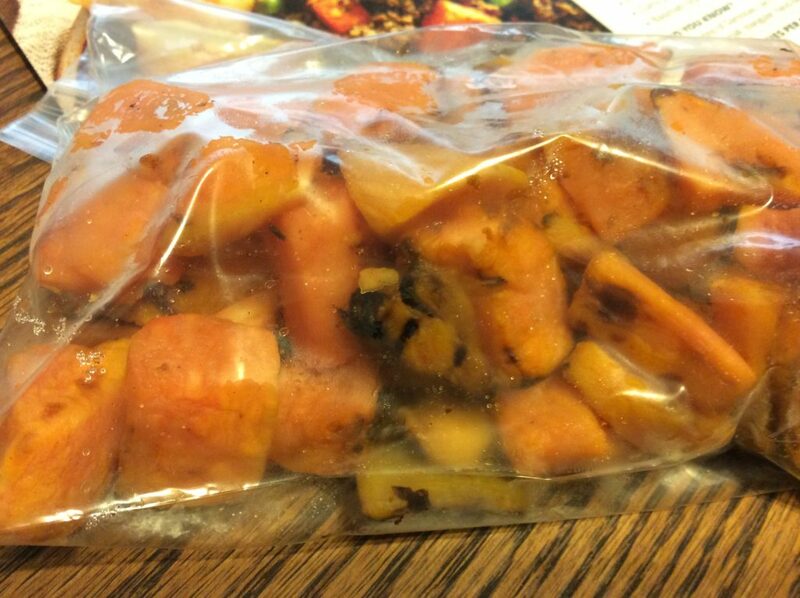 These precooked ingredients (rice, lentils, roasted sweet potatoes) were surprisingly tasty. Indeed, my daughter thought the rice was the best part of the vegan meal she had. Ingredients seem to be fresh and of good quality, though I had some issues. 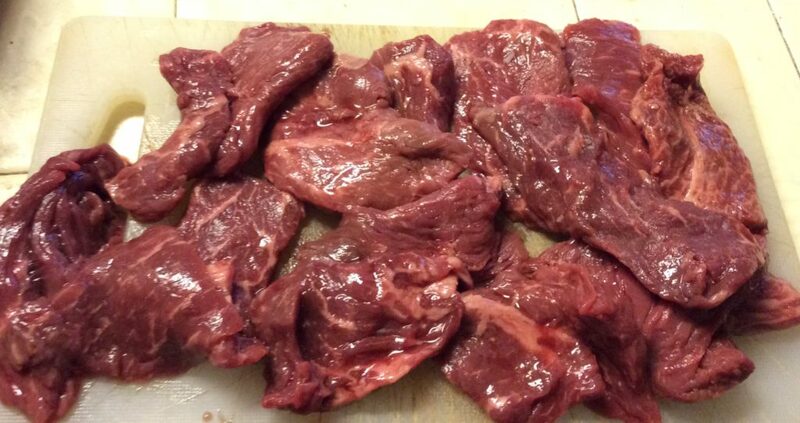 Instead of one or two steaks for one of the recipes, I received beef slices – which made cooking them according to the instructions difficult. I contacted customer service and they gave me a $15 credit, which was nice. Another problem – one that seems ubiquitous with meal kits – was that the portions of meats/seafood sent were of different size and shapes, meaning that you could not cook them at the same temperature without burning one. This I found annoying. One piece of tuna was long and thin, while the other one was small and twice as thick. Finally, several of their recipes required broiling. I am not always good about cleaning my broiler, and that’s a big task to undertake to cook a meal for a few minutes. I wish they gave alternative instructions for people without broilers. I was able to get my meals on a Tuesday. The day before they sent me an e-mail reminding me my delivery would be the next day but not giving me a tracking number. They can deliver as late as 8 PM, though I got all of my deliveries during the day. 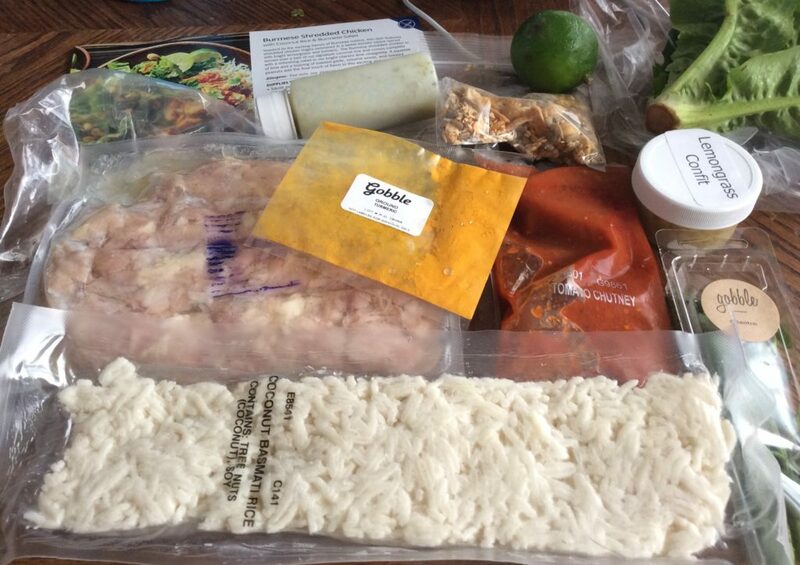 The kits come in a recyclable cardboard box, just like those from other meal kit companies. They contain non-recyclable insulating material and freezer packs that have to be discarded in the trash. Inside the box most of the ingredients come in plastic bags organized by recipe. Cold ingredients are at the bottom of the box, between freezer packs. In all, I cooked 8 Gobble recipes. The two I originally ordered, three more that I got when I forgot to cancel my subscription in time (fortunately I had that $15 credit, so it wasn’t as expensive as it could be) and then three more that I got with a “come back” deal. 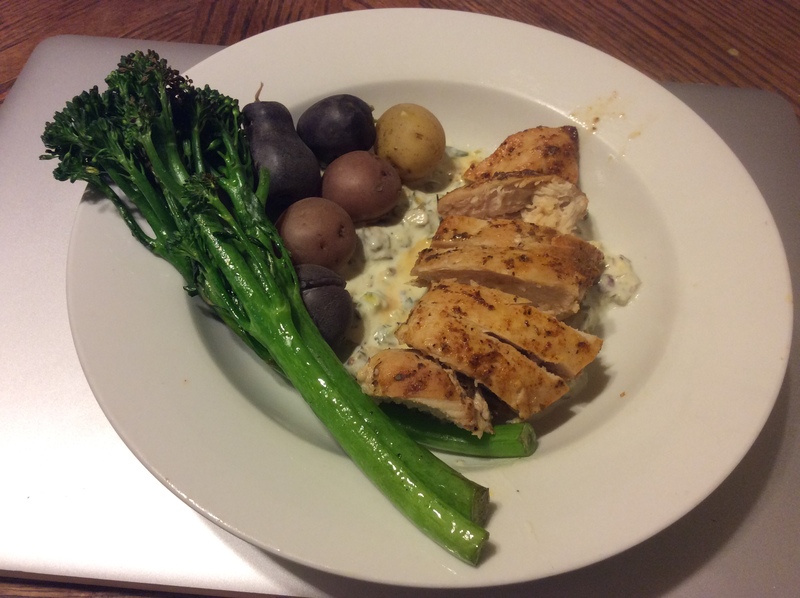 Three of the recipes were chosen by Gobble for me, but fortunately they did a good job. Great meal quality, but it wasn’t a steak. The tofu was tofu, but the rice was great! In all, I was pleased with Gobble. Most of the recipes weren’t mind blowing, but they were good to really good and quick/easy to prepare. I particularly liked their steaks (which don’t have a premium price). However, it’s the high price that would keep me from subscribing to Gobble. At over $13 per serving this is about the price of takeout, and with takeout I get leftovers (though not meats of the same quality level). It seems a particularly low value if you are not eating steak and tuna. That said, Gobble does have more variety than what I can get locally through takeout. 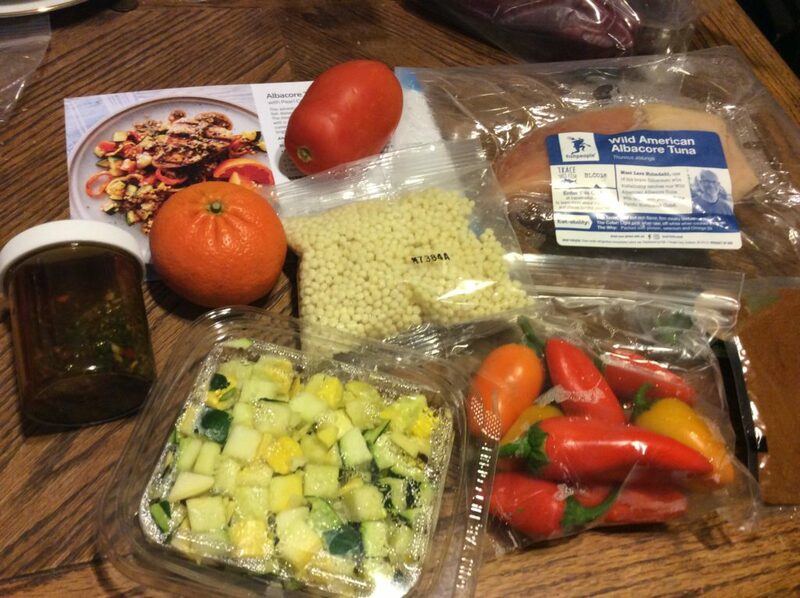 This meal kit was completely forgetable. I cooked it. I ate it – and despite the fact that it’s only been a couple of weeks, I can’t remember it at all. I do remember given the leftover broccolini to the dog (I don’t like broccoli or its derivatives) and she gladly ate it (she eats anything that is not dog food). But the chicken? The potatoes? No idea. The sauce looks good, though, and I feel I had a positive impression of it. With the rush of the holidays, I’m running very behind on my meal kit reviews – but I haven’t stopped getting them. My second week of Gobble, however, was a mistake. I somehow had neglected to skip it for the first week of December so I got stuck with 3 kits that I didn’t choose. 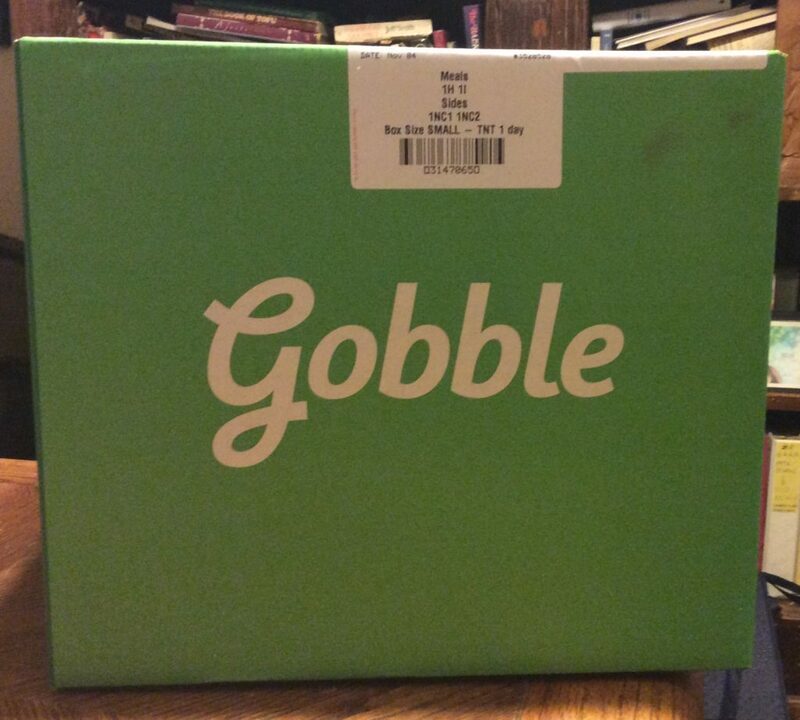 Given that Gobble costs $79 for a 3-kit box, that was a costly mistake. Fortunately, I had a $15 credit because of the mistake they made in my previous box, so it made getting this box more “palatable”. I was also lucky that the three meals Gobble chose for me werethings that I would have ordered myself – and they were all quite good. 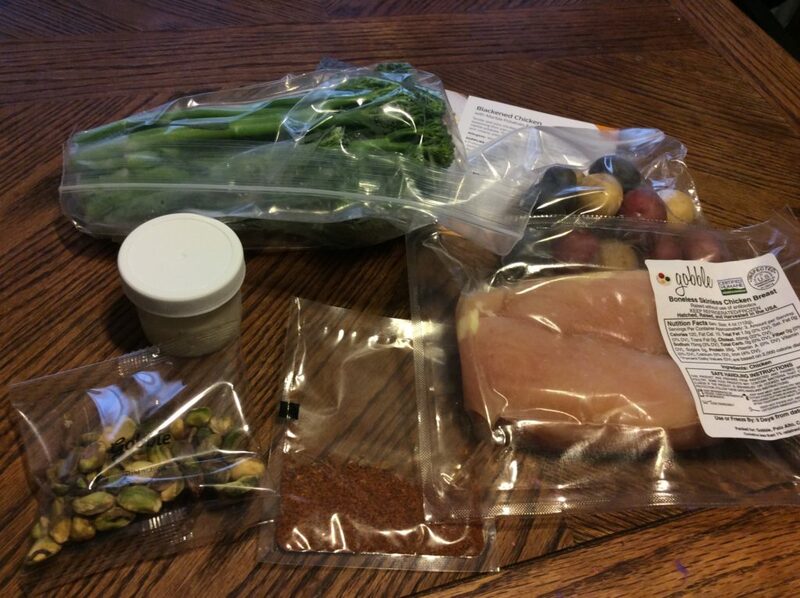 My favorite thing about Gobble is how quick and easy it is to prepare its meals. They send as many pre-sliced and pre-cooked elements as they can without compromising quality, and this kit for Curried Beef Bowl with Basmati Rice & Mini Samosas was no exception. 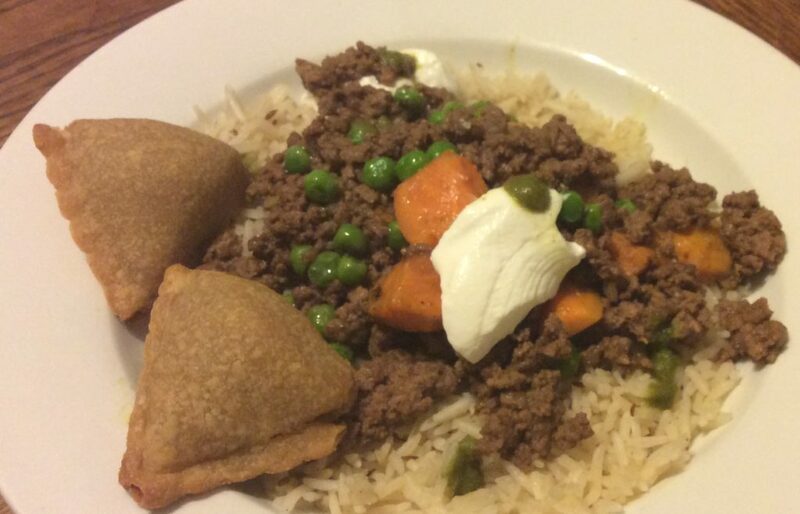 The tiny samosas came pre-cooked, so all I had to do was heat them up. They were very good and not too spicy. We often get fresh samosas from one of our local Indian food stores, so I don’t say this lightly. The main meal was simple to put together. The rice came pre-cooked, and all I had to do was heat it in the microwave. 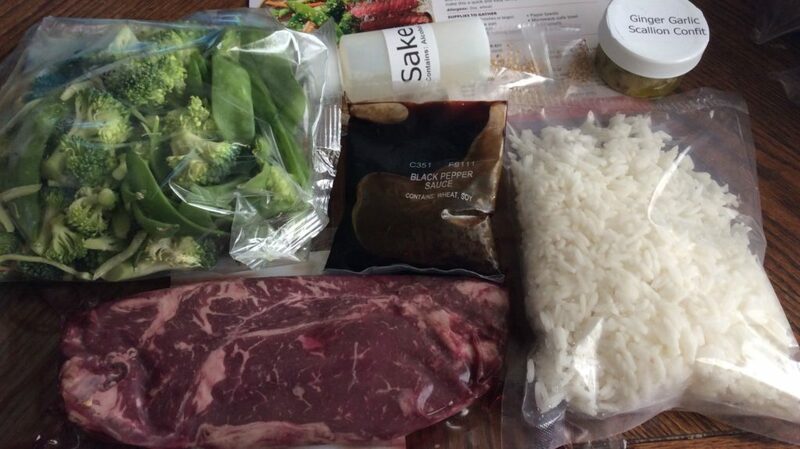 Gobble sends a very tasty precooked rice, which tastes even better than the one I make. The meat was quickly sauteed on a pan, to which I added the curry powder, the pre-roasted carrots and peas, a pre-mixed garlic/ginger/scallion confit and chicken broth. The results were great! It was a very tasty meal and both my husband and I enjoyed it. At $21, it was equivalent in price to the cost, before tax and tip, of take out – though, of course, we didn’t get leftovers as we do when we order out. Alas, the whole meal was ready much quicker than it would take to get a restaurant meal delivered. I will admit that my review of this meal kit for Albacore Tuna with Pearl Couscous, Chermoula Vinaigrette is, of necessity, incomplete. I made the tuna but didn’t make the couscous. I was tired that night, we weren’t that hungry and I figured I’d make the couscous for my vegan daughter later. Alas, I never did, and I ended up using up the peppers in a different recipe. The tuna itself was very good. 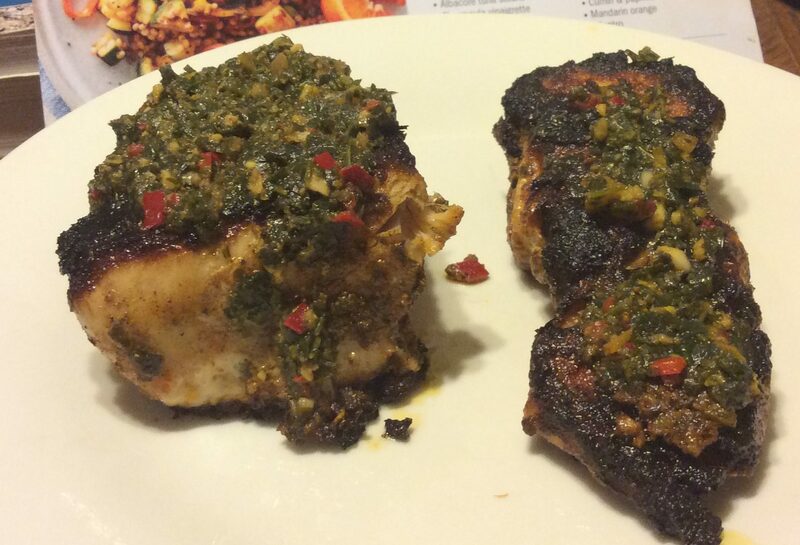 The recipe required that it be sprinkled with tuna and paprika and then marinated and cooked in the pre-made chermoula vinaigrette. The vinaigrette reminded me of chimichurri and it was delicious. I did have some issues with cooking the tuna, however. First, the recipe required broiling. I have one of those ovens with a broiler underneath, and I haven’t cleaned it in a while, so I wasn’t up for using it. I had to look up an alternative way to cook the tuna. More problematically is that the two tuna steaks that came in my kit were very different in thickness – one was twice as thick as the other. That meant that I couldn’t cook them at the same time as otherwise one would be very overcooked (and as it turned out, it was). 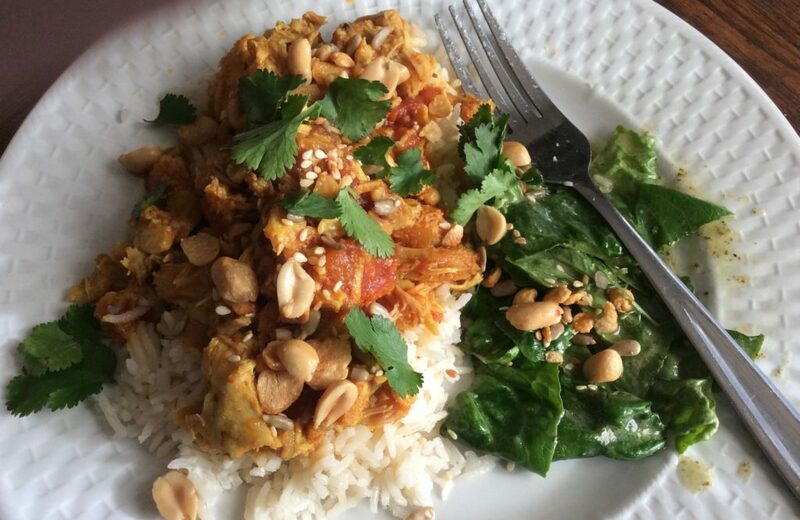 Still, both my husband and I enjoyed the tuna and I’ll be looking to re-create this dish with my own ingredients at a future time. 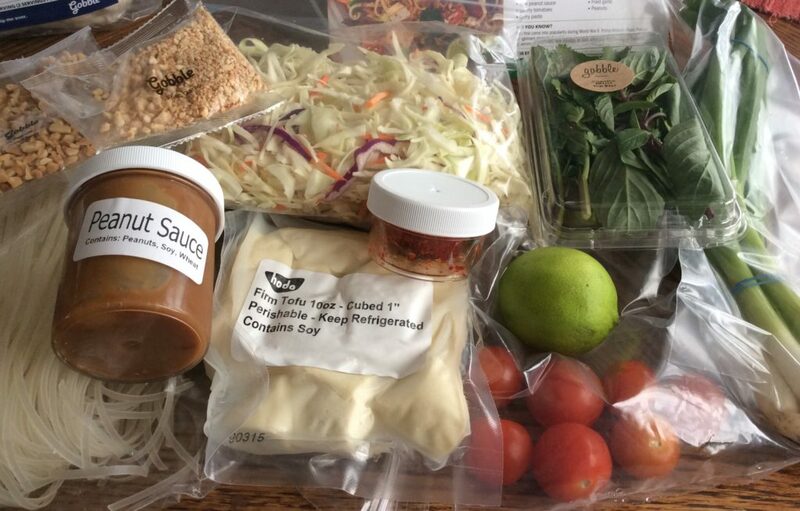 Gobble distinguishes itself from other meal kit companies by offering meal kits that can be put together in just 15 minutes. They do this by including some pre-prepared ingredients and having simpler meals than their competitors. 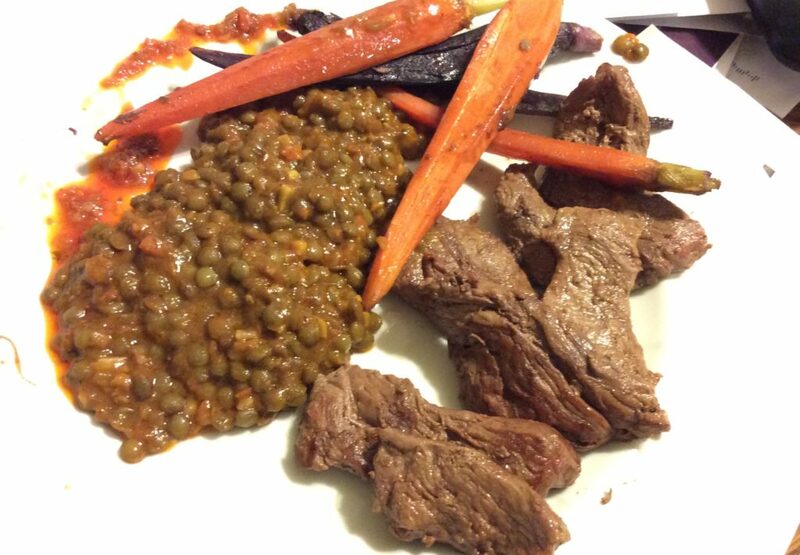 This meal kit for Seared Flat Iron Steak with Baby Carrots & Harissa Green Lentils consisted of just four ingredients: beef, carrots, pre-cooked lentils and their version of harissa sauce. 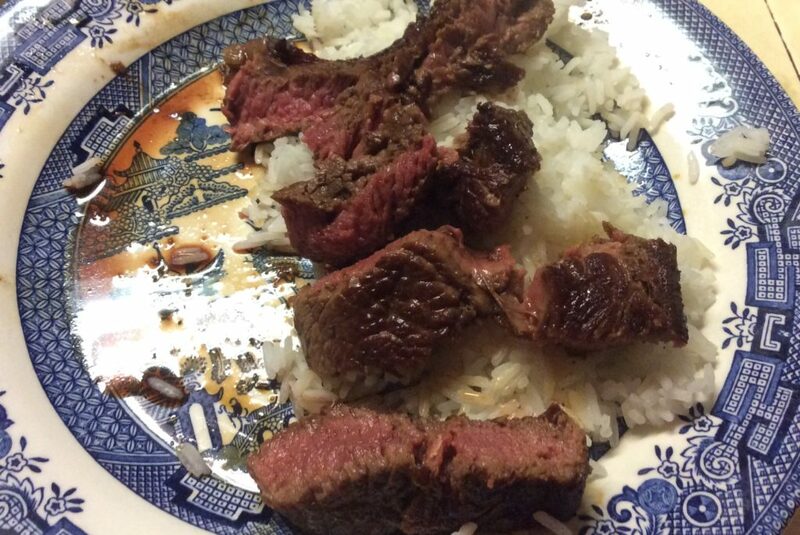 The beef was supposed to be flat iron steaks. Instead, I got a bunch of beef slices labeled flatiron. The quality of the meat was quite good and the beef was very tasty, however. The small, multi-color carrots were very cute but ultimately they just tasted like carrots. The lentils just needed to be warmed up in the microwave and then mixed with the harissa sauce. They were very good. The meal was a bit unbalanced, however. There were plenty of lentils and carrots but not enough beef – perhaps this was because I was sent the wrong package. Preparation seemed a little over complicated. The beef had to be seared on both sides, then the carrots had to be added to the pan and the beef transferred on top of them, then the whole pan had to be put in the oven for 2-3 minutes, then the beef removed and the carrots cooked for some more time on the stove top with some water. But having to use the oven meant pre-heating it, which to me added needless time and made it a waste of gas. Now, this probably would have been a simpler process if I had two steaks rather than a bunch of slices – which cooled down quickly while I was finishing the carrots. Still, the whole process was fairly quick – though probably longer than 15 minutes, but I’m a slow cook. I sent Gobble’s customer service a picture of the meat and they apologized and gave me a $15 credit, which I got to use as I forgot to cancel/suspend the service for the following weeks. All in all, I was very pleased with this meal, in particular the quality of the beef. I forgot to cancel or skip Gobble after my first week trial, so I found myself getting the default meals for this week. Of course, I had to pay full price for them (minus the $15 credit I got because they had sent me the wrong meat last time). Given my previous experience with Gobble, I wasn’t altogether upset at my error and I was happy to get a kit that I assume is vegan. 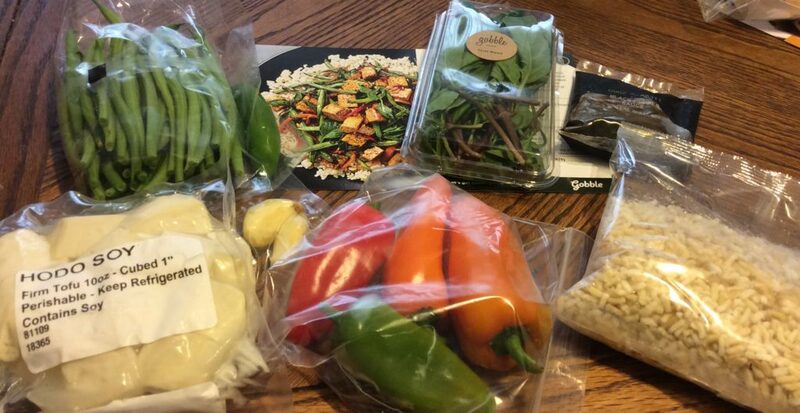 Gobble distinguishes itself from other meal kit companies by delivering kits that can be prepared in 15 minutes (maybe 20 for those of us who are slow in the kitchen). They do this by pre-dicing and pre-cooking some ingredients and including prepared sauces/spice mixes (other meal kit companies do the latter). 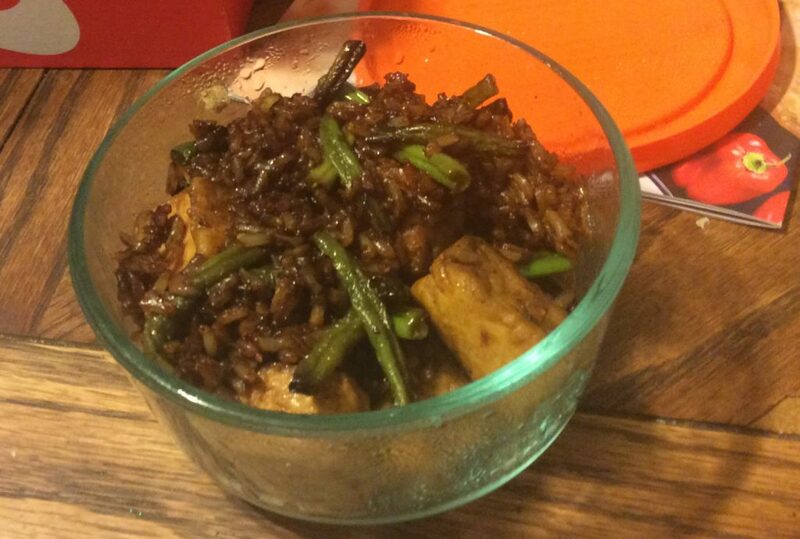 In this case, the rice came pre-cooked and just needed to be heated up in the microwave, and the tofu came pre-cubed. I still had to trim and cut the green beans, slice the garlic, remove the stems from the basil leaves and, had I used the chilies, I’d have had to slice them. While I prepared the veggies, my teen daughter actually cooked the meal and she found it to be quite simple to put together. She doesn’t like peppers, so she didn’t use them in this dish. She was quite happy with the results, and particularly loved the rice. The tofu, alas, tasted like tofu, but she hasn’t encountered a recipe in which it tastes of anything else (e.g. where it actually absorbs the sauce). The only concern we had about the meal is that it wasn’t a big enough portion for two people. She ate more than half for dinner (the photo shows the leftovers which she had for after-school snack the next day). From my perspective, the main issue with this kit is that it’s really expensive for what you get and not distinctive enough. 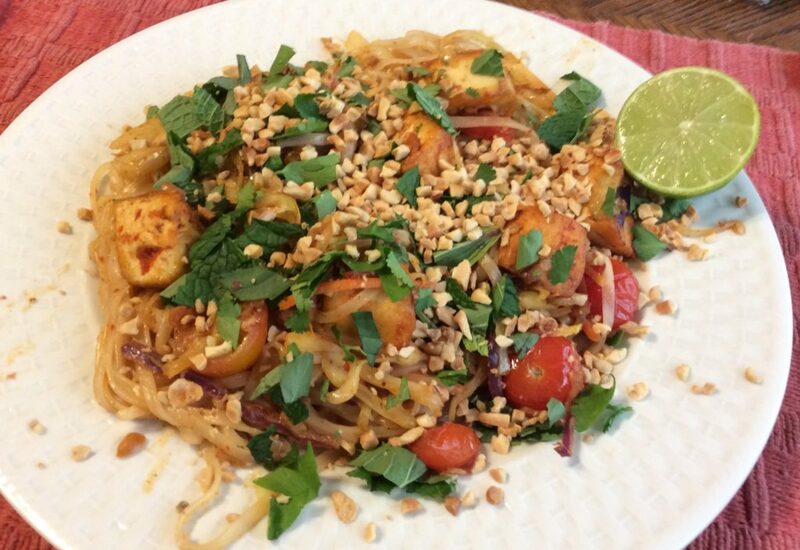 My daughter has been making herself stir fries with just as much ease for just a few dollars. Also, while this meal might have been vegan, Gobble doesn’t offer enough vegan/vegetarian meals for vegan/vegetarians to have choices every week.